Google Ad Blocker is the free software to quickly Block Google Ads on all Web Browsers such as Firefox, Chrome, IE, Safari, Opera etc. These days almost every website is filled with Google Ads and it is difficult to distinguish between the Ads and the real content. Often we end up clicking on that Download button or link which takes us to somewhere else than intended. Not only it is annoying but also leads to much slower browsing due to loading of Ads. Also it does not require any firewall or proxy server setup. All it takes you to just one click to block all the Google Ads instantly. Google Ad Blocker works on both 32-bit & 64-bit systems starting from Windows XP to new Windows 10 version. Google Ad Blocker includes Installer so that you can install it locally on your system for regular usage. This installer has intuitive wizard which guides you through series of steps in completion of installation. 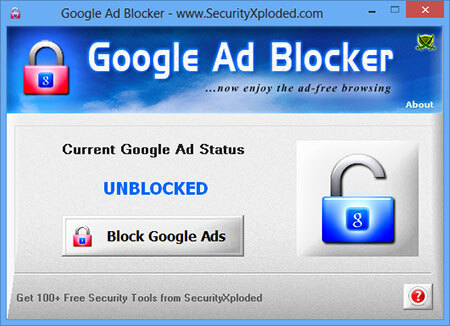 'Google Ad Blocker' is very easy to use tool with its cool GUI interface. It will show you the current status of Google Ads as seen in the screenshots below. Now you can just click on Block or Unblock button to block or unblock Google Ads. Mega 2017 edition with renovated GUi interface and support for blocking more Google Ads. New 2016 version with more improved module for blocking Google advertisements. Mega release with support for blocking Google ADs on new Windows 10 version. Added support for blocking more Google Adsense domains. Also fixed few minor bugs. Enhanced Google Ad blocking capabilities by integrating more Ad Links. Fixed the major issue with admin permissions. If you have got error in blocking Google Ads earlier even though you were administrator then it will work now. This major release supports blocking of more Google Ad Links. If you have already blocked Google Ads using previous version then just Unblock and Block again to apply new changes.